Ludwig von Mises said, “The middle-of-the-road policy is not an economic system that can last. It is a method for the realization of socialism by installments.” The middle ground between free markets and socialism is chaotic, with the only stable ground being free markets, on the one end, and socialism on the other. The free market being stability in wealth, and the latter being stability in poverty. Our current and impending healthcare debacle is an example of what Mises is saying in the quote. We haven’t had anything close to a free market healthcare system since government put a freeze on wages during WWII. The unintended consequence of this action was employers started giving health insurance as a benefit, in order to attract labor for employment, because they couldn’t pay higher wages. Up to this point individuals payed for their health insurance out of the wages they earned. The individual was insuring himself against financial ruin in case their was a catastrophic situation with his health. He paid for all other health care problems out of his earnings. Over the years the unintended consequences of increased Government regulations has moved our healthcare system into the chaotic middle ground we are experiencing. Obamacare has and will make our health care system more chaotic. It was designed as the next step toward a single payer health care system. Single payer is simply the Government controlling all decisions about the production and consumption of healthcare (aka socialism). Understanding health care becomes easier when you know a few things about it. 1) Health care is a good of service produced and exchanged in the free market, and is therefore not a free good. 2) Health insurance is a good or service produced and exchanged in the free market, and therefore not a free good. 3) Health insurance is not health care. Health insurance is just one of many arrangements, an individual can make to pay for healthcare. Health care is the good that health insurance pays for. 4) Even if someone thinks having health insurance or health care is a right, it doesn’t change the fact that both are economic goods, that have to be produced before they can be exchanged and consumed. Scarcity is what dictates if something is an economic good. If a particular thing is available naturally, like the air we breath, it isn’t scarce and therefore doesn’t have to be produced before it is consumed. Scarce goods have to be rationed because the demand for the good is greater than our ability to produce it. Prices ration scarce goods in a free market. The price of a good is the result of every individual making decisions on what they produce, exchange and consume. Each decision every individual makes, even if it has nothing to do with a particular good, has an effect on the production and consumption of that particular good. The reason it has an effect is because the scarce means of production have alternative uses. For example a barrel of oil doesn’t just produce gasoline, oil is used to produce dyes, rubber, resins, adhesives, asphalt, solvents, lubricants, nylon, polyester, acrylic, pharmaceuticals, and plastics. The means (resources, labor, time, capital) used to produce healthcare can be used for other purposes. If the compensation for their use in healthcare doesn’t cover the cost of production, they will be employed in uses that are more profitable. This scarce good (healthcare) will be made scarcer still. In our new socialized healthcare system, Government will have to ration healthcare because the artificially set prices will be meaningless for the purpose of rationing. 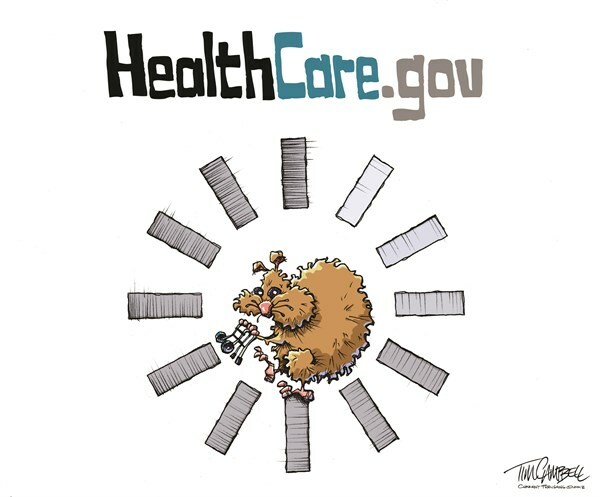 The health care website “glitch” isn’t even a cup of water in the ocean of problems that awaits us as this ever-expanding law begins implementation. The Government health insurance exchange is not health insurance. The exchange is playing the role of a broker trying to help individuals find “affordable” health insurance from participating insurance companies. What happens when the 2500 plus pages of regulations gets unleashed on what’s left of the market system? 1) Businesses have started to protect themselves against the future cost of the law in a number of ways: Keeping their number of employees under 50. Larger companies are cutting employers hours to under thirty per week. They’re getting rid of employer paid health care plans altogether because it’s cheaper to pay the fine (tax) instead of paying the insurance premiums. They’re making their employees pay more toward their insurance. 2) Insurance companies have been protecting their bottom line by increasing premiums in anticipation of higher costs. Some insurance companies have decided not to supply health insurance because it won’t continue to be a viable business model down the road. 3) Healthcare providers from doctors to medical device manufacturers have started to change how they do business because they know they will not be compensated enough to cover the cost of producing their good or service. The cost of our “new” healthcare system is already going up. We changed the whole system because there were supposedly 30 million Americans without health insurance, although these uninsured people could go to the emergency room to receive healthcare. The prices charged by hospitals and the prices charged by insurance companies are what cover the cost of treating these uninsured people, just like the cost of shoplifting is factored into the prices you pay at a store. This old way of paying for the uninsured is less expensive than the cost of insuring them under Obamacare. Obamacare incentivizes an increase in the demand for a scarce good, and a decrease in the supply of this same good. The scarce good becomes more scarce as supply and demand move in opposite directions. Government decisions will have to ration healthcare, but as the years pass the ultimate rationing mechanism for our socialized healthcare system will be waiting in line and death. Fortunately for us we have a culture of freedom. We will figure out a way around the government obstacles that have been placed in the way of us getting what we want, even if it’s an illegal black market for healthcare. Freedom is in the DNA passed on by our founding fathers, and I think we’re in the process of rediscovering it. 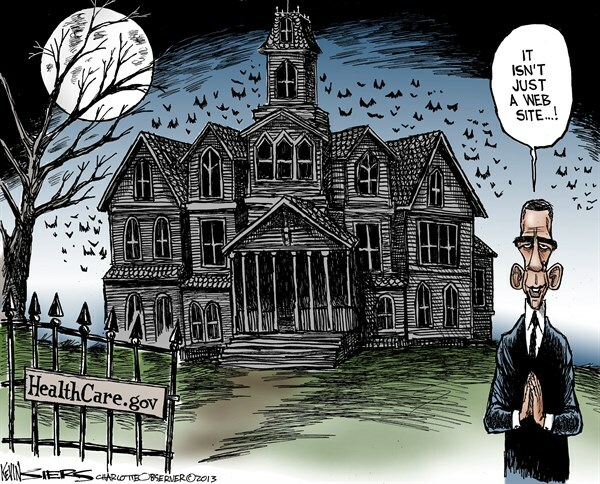 Ten Things to Expect From Obamacare, by Elizabeth Lee Vliet M.D., at caseyresearch.com. More cartoons here from theburningplatform.com. This entry was posted on October 28, 2013 at 7:42 am and is filed under Econ. 201, Government and Politics. You can subscribe via RSS 2.0 feed to this post's comments.